When my family first moved to Oklahoma in 2011, it was summer — mid- to late August, to be exact. We lived close enough to my younger daughter’s school that we could walk. At that time, she’d just started pre-kindergarten. So after school let out, I walked to the school to meet her and walk her home. Now, I don’t know if you’ve ever been in Oklahoma in mid- to late August, but it gets hot. We’re talking upper 90s to low 100s (Fahrenheit). Many of my summertime capri pants had no pockets, so I had no way to carry my cell phone. At first I tried carrying it in the waistband of my pants. But that was both uncomfortable and sweaty – yuck! So I knitted myself a solution. I called it a cell phone purse, but it was really just a wristlet bag. I knitted a bag that I could slip my phone into. Then I knitted a long I-cord to attach to the bag for a handle, and presto! I had a neat little “pocket” I could wear diagonally across my body, where the bag rested comfortably against my hip. Success! The wristlet bag is a perfect bag to whip up when you’re between projects and low on cash, because you can easily knit one using leftover yarn. As I’ve mentioned, it’s perfect for phones. It’s also great for MP3 players, because not all exercise clothes have pockets. They also make great gifts! You could knit one for everyone on your Christmas list. Yes, even the men; you’d be surprised at how many men would love a pouch to put their phone or iPod into. Conversely, you could whip up wallets or coin bags for the men or teenaged boys in your life. What’s that? You want some patterns? Of course you do. 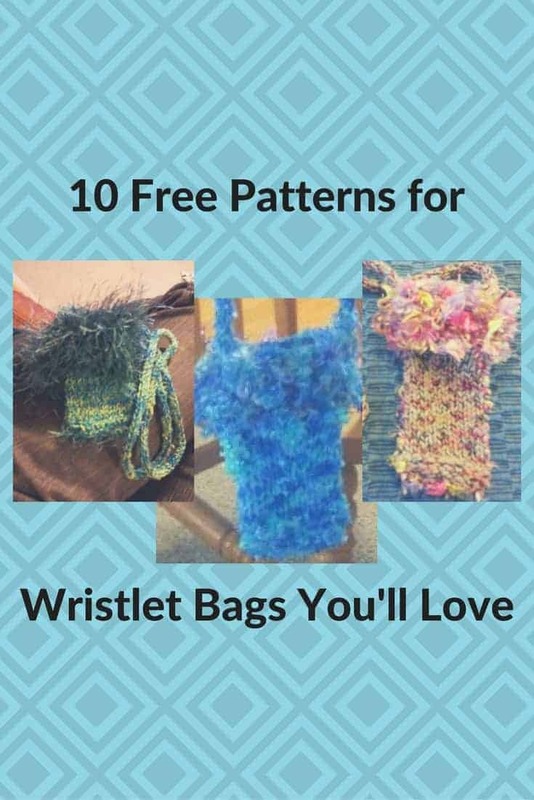 Check out the free patterns for wristlet bags below! Bow Pouch: It doesn’t get any easier than this very tiny pouch that looks more like an oversized bracelet! A great way to use up tiny scraps of yarn, the pattern page comes with suggestions as to how this little dandy can be used. Speedy Mini Purse: Quite a bit larger than the bow pouch (but what isn’t? ), still a quick knit and a great way to use up bits of yarn. Wrist Yarn Holder: What could be more fun to knit than… something to help you with your knitting? This is a great bag to create for those times when you want to knit but don’t have much space in which to do so. Handspun Wrist Wallet: This bag has the added feature of a zipper, which will probably take you longer to add than knitting the entire bag will! Bangle Wristlet Purse: Functional enough to be a great purse, pretty enough to be jewelry, there’s little not to love in this stylish purse, including cables and a nifty bangle handle. Bangle Bag Pattern: Like the idea of the bangle bag but want something a little simpler? This is your pattern. Poems Felted Clutch: If you have scraps of wool yarn hanging around, try knitting this adorable clutch with an added zipper. Flat and Cozy Cellphone Cozy: If you’re not really feeling like knitting in the round but want to make a quick cell phone cozy, this is the pattern for you. Includes a few different strap variations. Simple Drawstring Bag: This is a great little bag for a fancy evening out! It’s especially snazzy when knitted in a glimmer metallic yarn. Scroll down the page until you see the purse photo, then click the link to access the pattern. Zipper Pocket Wallet: If you want to knit a simple wallet that’s suitable for either a male or a female, this is your pattern. You can add a crocheted flower to make it a little dressier, or leave it plain for more widespread appeal. With the great assortment of knitting patterns for wristlet bags here, you can knit one for nearly everyone you know and make great gifts!